There comes a time in every FishDuck.com editorial writer’s life when he or she must make a prediction much too early, and for me, that time is now. It’s the perfect time. Spring ball has just finished, giving us all a chance to see the current team in action. Additionally, there are no major injuries that need to be accounted for, or recent suspensions due to the misguided tomfoolery that most college students engage in at some point in time. With that being said, May is not September, and the team will be dramatically changed by the time the Ducks suit up against Eastern Washington on Sept. 5, and even more changed by November, a month that can either make or break most teams looking for a spot in the second annual College Football Playoff. But the pieces are still there and that’s what I want to talk about. To begin, Oregon has made gains as a program every year since Chip Kelly entered the program, and that success has continued to stay constant even as Kelly departed and Mark Helfrich took over. There should be no worry that the overall quality of execution, leadership, or athletic ability will diminish from years prior. That means even if the offense will not be as explosive due to the departure of Marcus Mariota, the Ducks should have no problem consistently putting up 40 points a game. This sentiment is shared by many analysts who are continuing to rank Oregon in the top ten in their preseason polls. Safety Reggie Daniels is expected to be a huge contributor in 2015. The defense will be good too. The secondary is Oregon’s position group of greatest concern coming into the fall, and although they are largely young and inexperienced, the group is flush with talent. As far as I’m concerned, redshirt junior safety Reggie Daniels plays at an all Pac-12 level, and continues to improve (he had one of his top performances against Florida State in the Rose Bowl). The other probable starter at safety, Tyree Robinson, continues to develop and should be ready step into the spotlight by the start of the season. The Ducks will be breaking in two new starting corners; Chris Seisay, after filling in for injured All-American Ifo Ekpre-Olomu in last season’s national title game, is expected to hold down one side of the field. And if the 2015 Spring Game was any indication, the other corner spot belongs to sensational sophomore Charles Nelson, or a combination of Nelson and Arrion Springs, considering Nelson will most likely be playing both ways come fall. The youth, and the loss of Mariota, shouldn’t be a problem until the Ducks line up against Michigan State in East Lansing on Sept. 12. 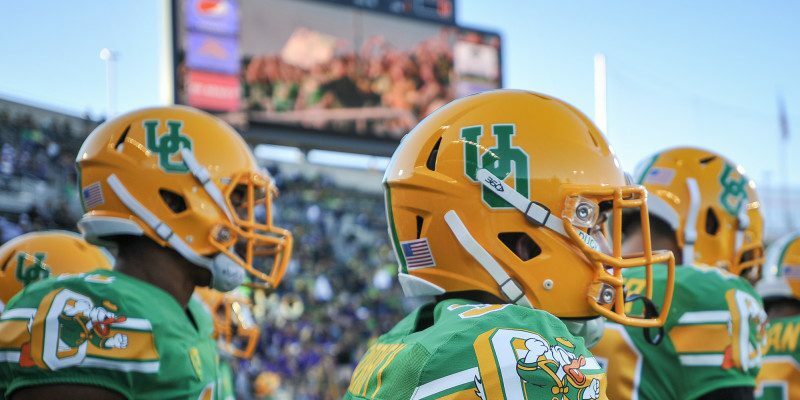 It’s Oregon’s second game of the season, its first away game, and the Ducks’ first real test. 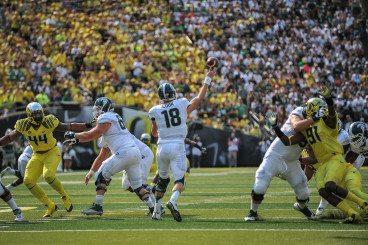 MSU will have an elite veteran quarterback in Connor Cook and boasts a steady, physical, B1G defense. The matchup is something to be concerned about, but if Oregon’s offense can break out for four touchdowns and the Ducks can score at least 30 points, they will be all right, statistically-speaking. The last time Oregon scored at least 30 points and lost a game was in 2011 against USC, and before that it was 2009 against Stanford. If Oregon can make it into the regular conference season unscathed they have another great shot of going 11-1 or undefeated and earning a spot in the Pac-12 Championship game. The team does not have to play UCLA or Arizona in the regular season, but the schedule does feature late season back-to-back matches on the road against Stanford and at home against Southern California. If Oregon does make it to the Pac-12 Championship game, they could play a number of teams, as the Pac-12 South is extremely competitive. Arizona, Arizona State, UCLA, USC, and Utah all took steps forward as programs last year, and none of them seem to be in any sort of decline. 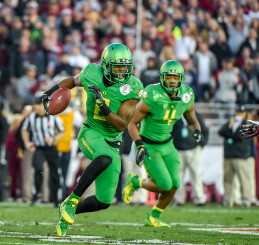 For me, USC is the only team of great concern for Oregon to get past late in the season. USC has continued to recruit five star talent, and now it does not have to worry about the scholarship restrictions that decimated its depth in previous seasons. If the Trojans can find a quarterback that can consistently make plays for them late in the game, they can be dangerous. 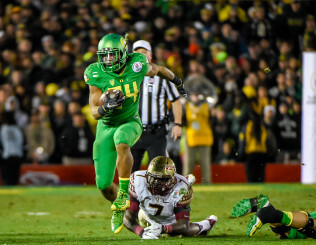 Thomas Tyner, one of many offensive weapons opponents will have to account for if they want to beat Oregon. But even the most talented teams are going to have their hands full with Oregon this year. The offense is loaded with playmakers, and the defense has a good mix of veterans and young talent. The best case scenario is a rematch with Ohio State, but this time in the Rose Bowl, and with an Oregon victory. Go Ducks.